Looking for a nailed-on winner in the birthday toy stakes? Then Lego is where it’s at. The Danish brick–by–brick behemoth produces hundreds of new sets each year, from massive kits to single mini figure packs, all of which are guaranteed to delight kids of all ages. Some of the larger models can take days, if not weeks to put together, especially those aimed at more grown up builders. It’s also worth considering that Lego now produces a wide range of themed toys, with everything from DC Comics to Harry Potter. Prices are high, but the fact that many sets can be rebuilt into different configurations and can be passed down the generations without ever feeling dated means Lego is always a worthwhile investment. Below we’ve rounded up the vest Lego sets you can buy right now. 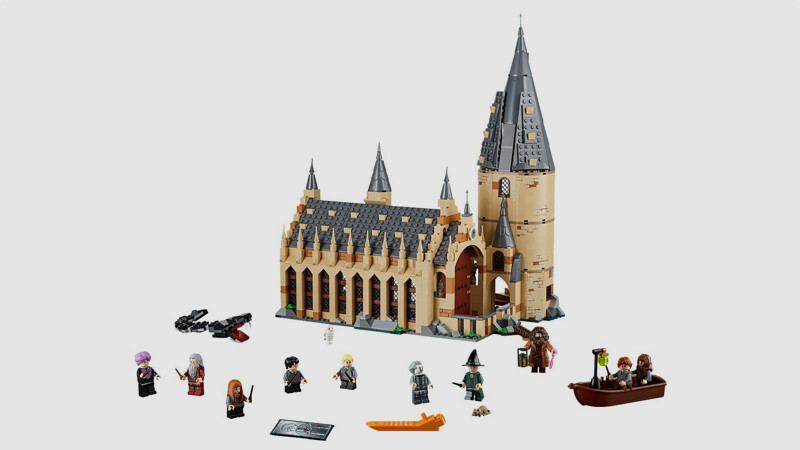 The enduring success of Harry Potter meant that this epic Lego set of the Hogwarts Great Hall was one of the most popular buys at Christmas, and continues to be a must-have for Potter fans who know their Nox from their Accio. Standing four storeys tall, the Great Hall is filled with details an avid fan will recognise – from the moveable Grand Staircase tower with spiral staircase, to the sorting hat and changeable Mirror of Erised. It also includes 10 minifigures of all the main characters, buildable Basilisk and Fawkes creatures, plus Hedwig and Scabbers figures. With 878 pieces to build and infinite play-time possibilities afterwards, the Great Hall joins up with the other Lego Harry Potter sets, including the Hogwarts Express Train and Quidditch Match Building set for the full Wizarding World of the Boy Who Lived. The Lego movies have done a grand job of capturing little and large imaginations alike at the box office, and the sets that recreate the adventures from the big screen always prove equally as popular. 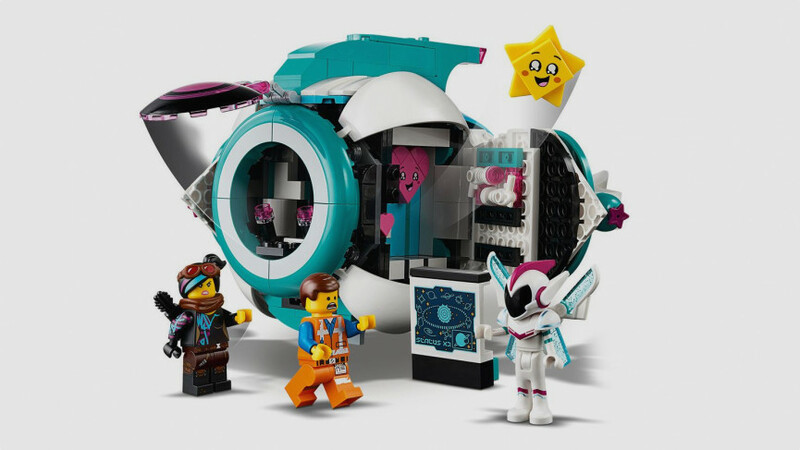 Straight out of The Lego Movie 2, this miniature version of Sweet Mayhem’s Systar Starship sees you helping Emmet and Lucy escape the bad guys. It comes complete with opening cockpit, retractable landing gear, disc shooter and prison cell, with removable control panel and gun. It also features five brand new characters from the film, with minifigures of Lucy and Emmet, a Sweet Mayhem mini-doll figure and buildable Star and Heart toy figures. Lego’s excellent Star Wars sets have been a mainstay of its range since the 1990s and with the recent run of new films set in George Lucas’s universe, a whole new array of kits have been launched. 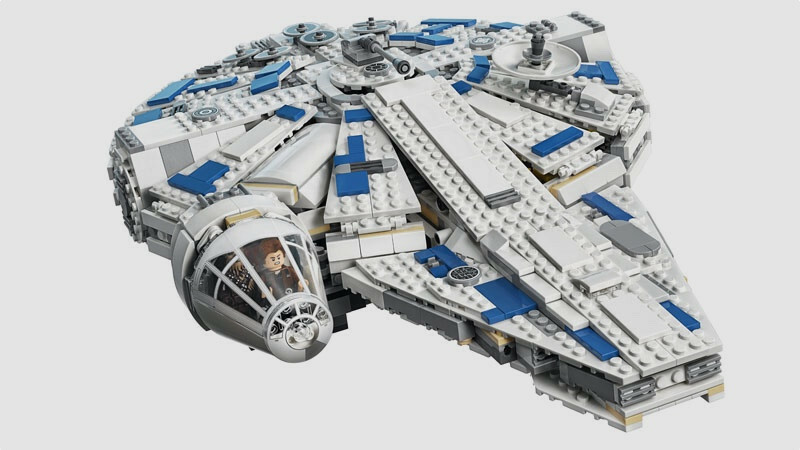 Taken from Solo: A Star Wars Story, the Kessel Run Millennium Falcon is a Lego take on the eponymous Han Solo’s record–smashing ship. There’s space in the cockpit for both Solo and his trusty sidekick Chewbacca, not to mention removable sides for easy access to the cargo area, as well as the hologame table and bar. There are six mini figures in the box, as well as a DD-BD droid, vital for getting repairs done on the fly. This is a large set, measuring 11cm high, 30cm wide and a massive 48cm long. A proud centrepiece for any Lego collection. The Technic brand has a long heritage, its advanced sets appealing to older builders. And this hugely impressive set, made in conjunction with French supercar manufacturer Bugatti, takes things to the next level. 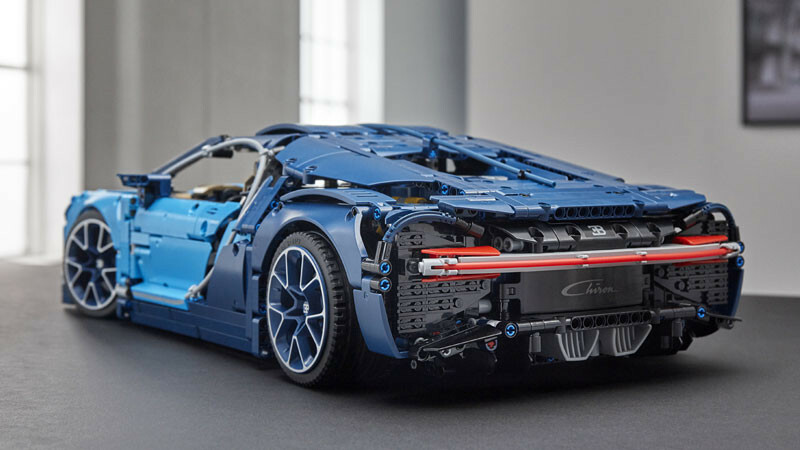 A 1:8 scale replica of the original car, with the same two tone blue finish, the Lego Technic Bugatti Chiron features a movable paddle gearshift, an engine with moving pistons, spoked rims and an active rear wing. There’s even an eight–speed gearbox and a steering wheel adorned with the iconic Bugatti logo. Pop the hood and you’ll find a Bugatti overnight bag, just like the one you find in the life size version of this modern classic. This set is ideal for anyone who’s a petrolhead, tech fanatic and Lego fan. This special set offers kids double the fun, as the buildable Lego Batmobile turns into a remote-controlled car for patrolling the means streets of Gotham once it is complete. 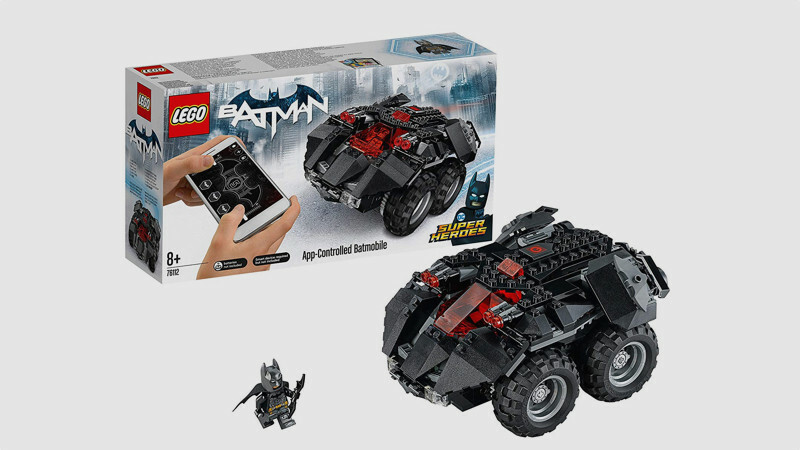 Featuring two motors that are powered by a Bluetooth-controlled battery hub, the motorised Batmobile comes with an opening cockpit, four-wheel drive and two dual-stud shooters, plus an all-new Batman minifigure and accessories. The Batmobile can be controlled using an app on a phone or tablet (iOS/Android), though do be aware it is recommended for indoor use only. For all its tie ins with major movies and more adult–oriented, tech–heavy sets, Lego is still at its best when it develops its own concepts. The City brand, which offers everything from train stations to mobile pizza vans, fires the imagination of kids like nothing else. Although many of its sets can be costly, this snazzy little vehicle is a snip at £7.99 is way beyond your average Lego car, with breaking the land speed record in mind. 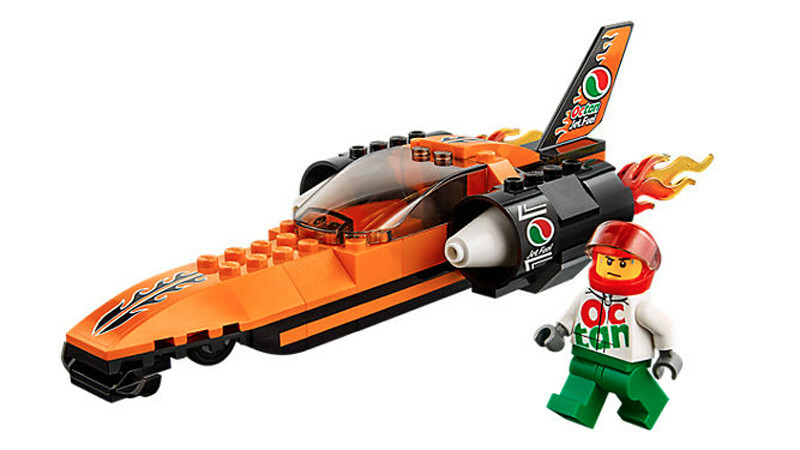 It comes with an iconic mini figure decked out in the Danish company’s own Octan petrol brand clobber, with space for him t o fit neatly into the cockpit. There are even flame details which can be attached to the rear wing. From there, it’s up to your kids to come up with how his land speed record attempt goes. Is it a case of not nippy enough? Or wowing crowds of other mini figures with his derringdo? 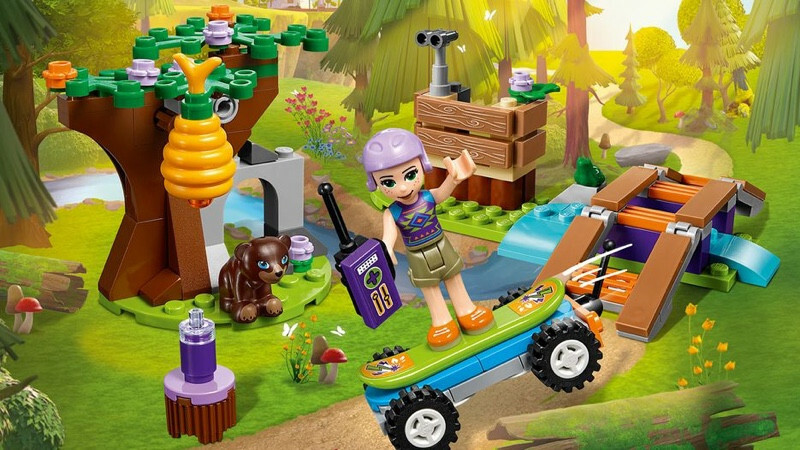 Lego Friends is another of Lego’s own hugely popular concepts, and centres around five very different friends and their adventures in the very colourful Heartlake City. The larger sets focus on building up the houses, vehicles and shops that make up the Heartlake City metropolis, but more affordable scenes, like this one, are also available (and take up much less space too). We love this set, which takes your child on a wildlife spotting adventure with animal-lover Mia. The set features a buildable skateboard to get Mia around on, a lookout post, a bridge and a tree, plus a Mia mini-doll figure and accessories as well as two animal figures – a honey-loving baby bear and a frog. 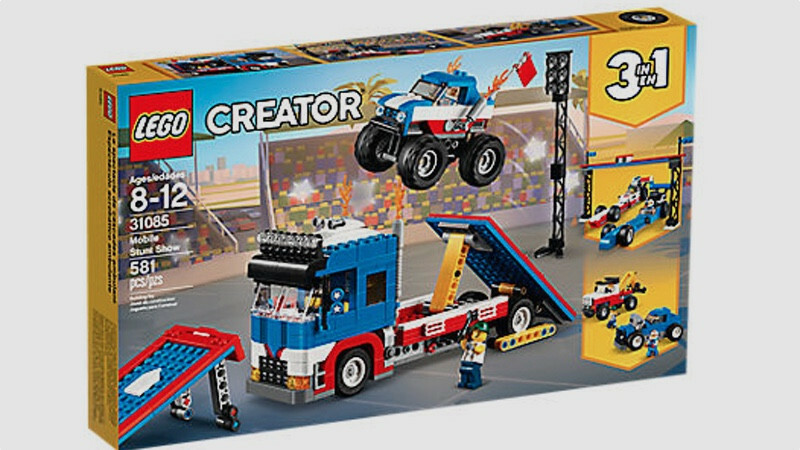 Lego’s Creator range is excellent for those who get easily bored with just one option when it comes to building regular sets. This 3-in-1 pack features a Mobile Stunt Show with flatbed transporter and fold out ramps for the monster truck to ride on and off. The stuntwoman and her mechanic can even bunk down in the cab with its bed and TV. What makes it truly stand out, however, is the fact it can be rebuilt to include two drag racers or a Hot Rod pickup. This all harks back to the old days of Lego, when making and breaking sets into something new, different and exciting was the name of the game.